In 1780, British troops embarked on a series of raids near what is now the Vermont-New Hampshire border to discourage colonists from spreading the American Revolution into Canada. However, they didn't count on Hannah Hendee. On October 16, British soldiers led a force of about 300 Mowhawk and Wabanaki allies down the White River valley for a surprise attack on the frontier town of Royalton, Vermont. The troops easily destroyed the town. The raids continued through the towns of Sharon and Tunbridge. The army burned houses and took prisoners as it went, destroying most of the homes in the area. The British Army had promised a reward for any men or boys seized in the raids. The Indians would be paid for each prisoner delivered to the British in Canada. As word spread of the raid, local militia began converging on the area and the night of the raid they attacked. The British sent word that if the attacks continued, the hostages seized in the raids - some 35 men and boys - would be killed. Stymied, the American militias backed down. 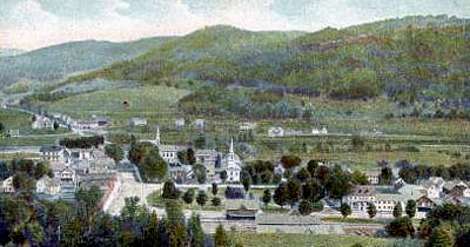 Postcard view of South Royalton, Vt.
During the raid on Royalton, the Hendee (some sources spell the name Handy) family had fled their home. Hannah had taken her two children to hide in the woods while her husband ran to spread the word. A group of Indians had found Hannah and the children and took her young son, Michael. That night, as the British and Indian forces prepared to leave, Hannah Hendee arrived in their camp. Some sources say she waded across the White River to reach it. Furious, Hannah Hendee demanded the return of her son. The boy would not survive a march to Canada, she told Lt. Richard Houghton. He would perish and so would the other children taken, and their blood would be on his hands. There is no record of exactly what Hendee said to persuade her opponents, but Houghton and the Indian soldiers released nine children to Hannah Hendee, and she returned them to their families. In all, four colonists were killed in the Royalton raids. The remaining prisoners, some 26 men, were marched to Canada for the reward money. There the British imprisoned them, some for as long as two years, while the war played out. One of the boys was so scarred from the attack that he never was able to fully recover and spent his life as a wandering recluse. As for Hannah Hendee, history is silent about what became of her. Some records suggest she went west as a pioneer after the war. Roylaton, meanwhile, rebuilt. The new community was far less scattered than the original, with buildings clustered closer to one another. And in 1915, on the South Royalton Town Green, a memorial arch was raised: The Handy Memorial to remind everyone of Hannah's courage. Thanks to History of Royalton, Vermont, Mary Evelyn Wood Lovejoy.